Unique is an overused word. But as the Parador de Cañadas del Teide sits in the centre of a manic, volcanic landscape at the foot of Spain’s highest mountain and the third largest volcano in the world then yes, unique seems the right word to describe it. Staying here is an experience and then some. 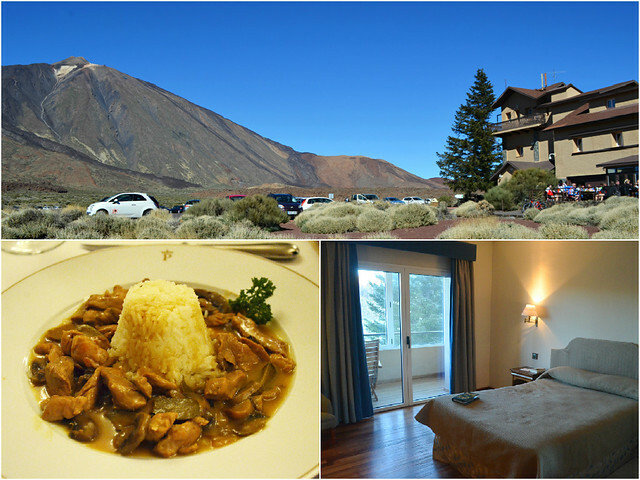 The Parador de Cañadas del Teide is located in Teide National Park at about 2100 metres above sea level almost in the centre of Tenerife. It sits next to the Roques de Garcia and a short drive from the cable car station which transports thousands daily to near the summit of Mount Teide. Both areas are excursion hot spots and incredibly busy during the day. Although there’s plenty of parking beside the Parador, the spaces fill up early with day-trippers. Once darkness falls and the day-trippers leave, the National Park falls silent. That’s when the magic really starts. What is the Parador Like? 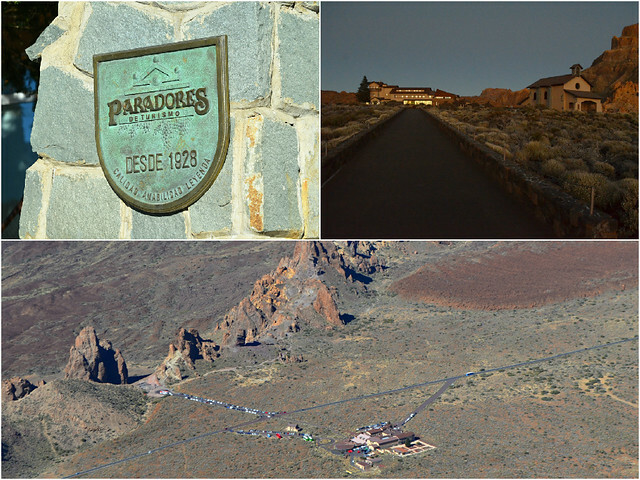 For me the quasi-Alpine style of the Parador fits the landscape around it perfectly, especially as the colours of the hotel’s walls and roof reflect the tones of the sand and earth that gives Teide National Park its surprisingly multi-coloured terrain. From above, on the crater walls, it’s a pinhead of a building in an epic landscape, blending in so seamlessly with its surroundings that it can be difficult to spot. As you expect from a location where nature has created the most spectacular attraction any hotel could wish for, amenities aren’t important. But there is a small covered pool and a tiny gym. One of the most amazing attractions is the sky at night at this altitude and there are stargazing sessions held each week. There are also serious telescopes for guests’ use, but they looked far too complicated for a casual stargazer like me. The Parador was built in 1954 and, despite a renovation a few years ago, the interior still looks as though it’s from that era. Some criticise it for being dated but we liked the communal areas. The décor has an old-school traveller feel to it; the sort of place Holmes might lodge in pursuit of his nemesis. It’s also cosy with a huge fireplace, which in winter at this altitude is essential. The bar has an outside terrace, hidden from the day-trippers, with a full-on view of Mount Teide; perfect for a post-walk beer (prices aren’t that high considering those of the adjoining café). 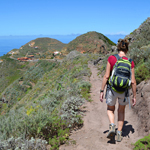 Which takes me to the best activity staying at the Parador opens up to guests – walking in Teide National Park. We’ve walked in the crater many, many times, but slipping into a comfy armchair after a climb to the top of Guajara knowing that there was no long drive ahead and a comfy bed lay close by was just a delicious feeling. The bedrooms are of a decent size and comfortable with flat screen TV, a couple of armchairs and a bathroom with his and hers sink (or his and his/hers and hers etc.). However, they are dull. I know what’s outside the window is spectacular but there could have been a bit more imagination and effort when designing the look of the rooms – a missed trick. Some finishings (the headboard in our room) look as though they’ve been done by someone’s aunt. Wi-Fi is supposed to be available but we never managed to get it to work. Saying that, it is warm and comfy and there are killer views of the park. The best part of our room was a covered terrace from which we could close the blackout curtains and sit and allow ourselves to be hypnotised by the most magical night sky. That more than made up for the unimaginative décor. Much better than we expected. Some reviews of the food we’d seen and heard had been less than favourable. I’ve no idea what they were on about. The portions at dinner are generous; a starter of almogrote and local cheese was enough for two people easily. Main courses are diverse, consisting of Canarian cuisine with international touches. And the measure in a glass of wine is equally generous. In short, dinner was most enjoyable. However, there was one thing that irritated us at the start of dinner. The restaurant also caters for excursion dinners and there weren’t enough staff to deal with the amount of people dining. Subsequently guests were left waiting whilst excursionists were fed. That’s not a good service as far as paying guests are concerned. Breakfast was a more laid back affair. The buffet is small but with a good selection for its size – cereals, yoghurts, hot dishes, continental style cold meats and cheeses and lovely little pastries; all good quality products. All staff were very, very friendly and helpful. This was also something that contradicted some reports we’d heard. What is the Best Thing About The Parador? There’s no pondering where this is concerned. 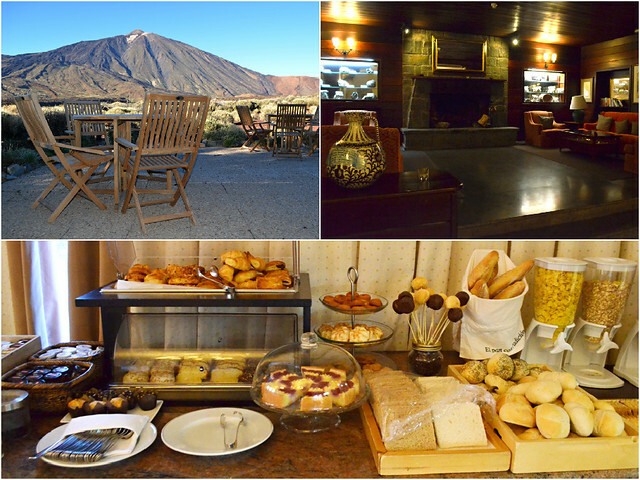 Its location makes the Parador de Cañadas del Teide an extra special place to stay. Viewing the night sky in the crater and watching the sun rise on the slopes of Mount Teide are both priceless travel experiences. Who Would it Suit Most? Anyone with a love of the outdoors and stargazers. The guests were made up mainly of hikers and cyclists. But it’s also an extremely romantic location as well. 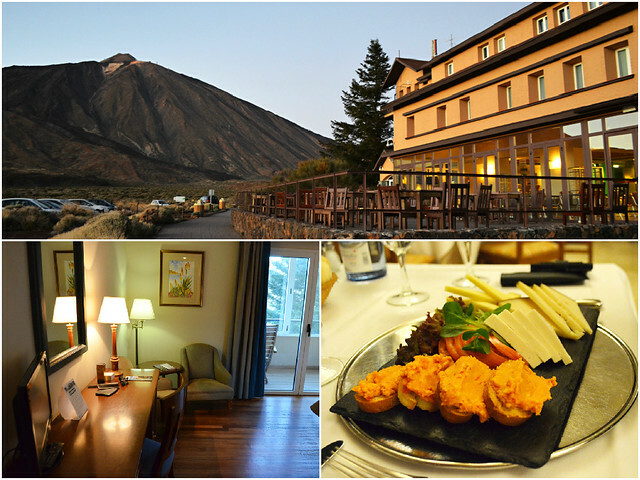 Parador de Cañadas del Teide; Teide National Park, La Orotava; Tel (+34) 922 386 415; rooms from €90. Are Tenerife’s Blue Flag Beaches Marvellous or Mundane? 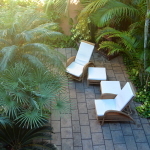 Enjoyed this review – brings back memories of our stay there 5 years ago! The sunset was fabulous and we loved the reception area with its log fire. Our experience, like yours was that the breakfast was better than the dinner (large group getting most of the staff attention etc). TIP: If we went again, we would drive over to the other side of the park for our main meal, not eat it at the Parador. But we would make up for that at breakfast. Thanks for the tip. It sounds like a good alternative. It was probably a couple of years ago I heard about staff not always being very helpful so maybe there has been a change. I can’t remember how long ago it is since I stayed there, a year or three, but my experience was just like yours, except that, happily, there was no tour group, so service at dinner was just fine, and it was an excellent meal. I’d been let down by a friend who was supposed to go, but decided to go on my own, and had none of that “uff, woman on her own, she can wait until we get around to serving her,” that I’ve experienced elsewhere. I went specifically in November to experience the Leonid meteor shower, but it was a night when they did the stargazing thing, so I went. That was awesome, so much infomation in such an entertaining manner! It finished sometime after midnight and I slept through the alarm I’d set to see the Leonids at their best around 4am!